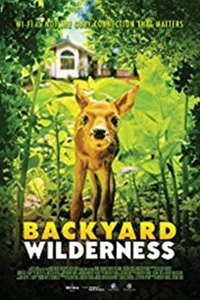 Description Backyard Wilderness is a 3D Giant Screen film shot in a suburban woods where humans and wildlife mingle. The film overturns convention by taking the point-of-view of the animals as they observe a human family living in their midst - in fleeting glimpses and snatches of conversation. The dramas and beauty of forest life are captured in rare intimacy by immersive 3D cameras - mounted inside dens and nests, moving along forest floor and pond bottom, and revealing through time lapse marvels of nature invisible to the human eye. But the modern family dwelling in the woods is blind to the real-life spectacle around it, absorbed by its array of electronic devices - until a twist of fate in the film's climax awakens them to the infinite wonders of life in the wild.